Before the breakout of WWII grand prix racing and voiturette racing was experiencing its golden era, particularly in Europe. Grand Prix being the equivalent of today’s Formula One, and Voiturette (1,500cc supercharged) the Formula 2 of the era. Here in Australia the first Australian Grand Prix was held in 1928 at Phillip Island. In those days Australian Grands Prix were staged as handicap events. 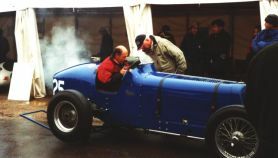 The 1928 event was won by Col. Arthur Waite in a supercharged Austin 7. One car that has survived time from this first AGP was the German Wanderer W6, which has remained in Victoria, Australia and is now back on the road. The car remains in mainly original unrestored condition. During this pre-war period many creative, mechanically-minded Australians set out building “Aussie specials”. Such cars took on the most expensive cars from overseas. Cars such as Black Bess achieved great results against Monza Alfa’s, Delahaye and alike, particularly closer to war breaking out. The historic racing events feature races comprising of Group J (Vintage) and K (PVT) cars, which now days are combined with Group Lb (immediate post war sports racing and racing). In recent times history has repeated itself at events where Ford V8 Specials have won against Alfa Romeo 8C-35. We are now blessed to see a great cross-section of vehicles, from newly built specials like the Gipsy-Fiat to T35, T37A & T51 Bugatti on the grid. This era takes in the 1930s, the lead up to the break out of WWII. This decade on the world stage saw Bugatti and Alfa Romeo dominate early on, then came the force of the Third Reich and the dominance from the mid-thirties to the outbreak of the war by the Hitler back Mercedes-Benz and Auto Unions. Locally in Australia this period saw signs of Australian built specials. The likes of Jack Snow and Peter Whitehead imported the previous seasons Grand Prix cars from Europe dominated Grands Prix at Fishermans Bend, Bathurst and Lobethal. But it wasn’t the ERA, Delahaye or Alfa Romeo Monzas that cleaned up all of these pre-war events. In fact some Aussie-built specials had huge successes, including the West Australian Alan Tomlinson who built up a monoposto (single-seater) MG TA Special, going on to win the 1939 Australian Grand Prix, and then a handicap race.